Tour de Fleece! Two first stages! 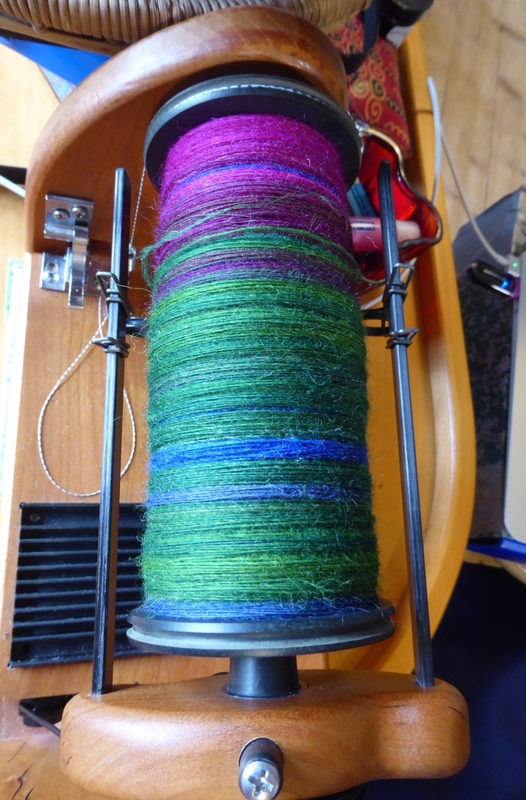 July 3, 2016 - 6:26 pm Marilyn F.
Lovely yarn – what bright colors! Do you have a special project in mind or are you just spinning for the pleasure of it? Thanks! I’m spinning for a shawl. Peace Sign Shawl by Spider Mambo Designs, perhaps. I’ll chain ply. July 4, 2016 - 1:43 pm Marilyn F.
Yes, I was wondering if you would chain ply, we call it Navajo Plying here. A great way to keep the color sequence. I’m sure it will be a lovely shawl with your fine yarn. Happy Knitting and Spinning . . . I too used to call it Navajo plying, until I read somewhere (Spin Off?) that the Navajos never plied like that. So I use “chain ply” (kedjetvinning) like most Swedish speaking spinners do nowadays. The term is also spreading into Finnish (ketjukertaus). I also like “chain ply” because it describes the technique. July 4, 2016 - 2:29 pm Marilyn F.
Yes, I agree with you that “chain ply” is much more appropriate and descriptive of the process. Odd how names like “Navajo ply” get attached – I’m not sure where it came from. I do enjoy plying that way and like the results of keeping a color sequence. Some spinners/knitters say that the bump that occurs can tend to stick out in knitting and not blend in. Perhaps their knitting was very loose? I haven’t had that problem – have you? If you use stiff fibers the bend won’t stay flat. For that reason I never chain ply fibers that won’t bend easily. July 4, 2016 - 11:50 am ElaineChicago. A bunch of us are also participating in the Tour D’ Fleece with the above mentioned Crazy Sheep Lady as our Leader. Your yarn is so finely spun and has such lovely colors. Spin On! Thanks! I found your group! Have a nice Tour! I’ll switch over to Eurosport now and watch the 3d stage. July 4, 2016 - 2:17 pm ElaineChicago. I’m rooting for the man in the Wonder Bread Wrapper shirt (Red, yellow polka dots!) Wonder Bread is big over here. Will look for him! Haven’t seen him yet. July 5, 2016 - 6:29 pm ElaineChicago. I just saw a bunch ohm people on the sidelines wearing the same polka dot shirt. It’s only red dot. This is stage 4, I think. There are people with polka dot shirts on the road sides throughout Tour de France. It’s a way to show support for the riders. what fun….you made Sara at Punkin’s Patch very happy!